“Just what is a Muscle Car?” Road Test magazine asked in June 1967. The answer: “Exactly what the name implies. It is a product of the American car industry adhering to the hot rodder’s philosophy of taking a small car and putting a BIG engine in it. . . . The Muscle Car is Charles Atlas kicking sand in the face of the 98 horsepower weakling.” Unconcerned with such trivial details as comfort and handling, the vintage American muscle car was built for straight-line speed and quickly became the ride of choice for power-hungry racers and serious gearheads. In a country where performance was measured in brute force, a quarter mile at a time, the muscle car was the perfect machine. In the intervening years, these down-and-dirty, high-performing beauties have earned their place in the automotive pantheon. As prized by collectors and aficionados as they are by denizens of garages and drag strips, classic muscle cars now fetch upwards of a million dollars at auctions and feature in any story of America’s automotive glory days. 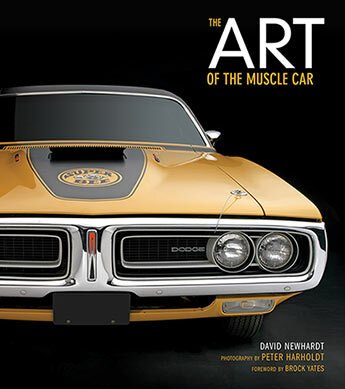 The icons of muscle car art—including Camaro and Chevelle SS, the Hemi and 440-6 ’Cuda, Challenger, Roadrunner, Super Bee, GTX, Super Bird, Daytona Charger, Super Cobra Jet and Boss Mustang, Talladega Torino, Buick GSX and W30 Oldsmobile 442, and AMX Javelin—are all here, on full display in this lavishly illustrated volume, each described in a detailed essay followed by a gallery of portraits and special gatefold presentations that capture the art of the muscle car at its finest. Photographer and writer David Newhardt was born in Chicago, Illinois, and attended Southern Illinois University majoring in professional photography. He served eight years in the US Navy aboard nuclear submarines before settling in Southern California. Newhardt worked at Motor Trend for three years and has been on the mastheads of many automotive magazines. He has worked in the fashion photography field but finds automobiles easier to deal with. The author of seven books, Newhardt has supplied scores of other books with images. A long-time member of the Motor Press Guild, he is married and has two sons. Newhardt lives in Pasadena, California. davidnewhardt.com Peter Harholdt is a lifelong car enthusiast, SCCA racer, and preeminent studio photographer. He has been entrusted to photograph countless priceless works of art for museums and exhibit catalogs. He first developed his portable studio to create the stunning hot rod portraits featured in Motorbooks' Art of the Hot Rod. Harholdt lives in West Palm Beach, Florida. peterharholdt.comPeter Harholdt is a lifelong car enthusiast, SCCA racer, and preeminent studio photographer. He has been trusted to photograph countless priceless works of art for museums and exhibit catalogs. He first developed his portable studio to create the stunning hot rod portraits featured in Motorbooks' Art of the Hot Rod.Official Website: www.peterharholdt.comDavid Newhardt is one of the best automobile photographers working today and has provided photography for best-selling Motorbooks titles Muscle: America's Legendary Performance Cars, Corvette: Fifty Years, Mustang: Forty Years, Mopar Muscle: Fifty Years, and Shelby Mustang: Racer for the Street. He lives in Walworth, Wisconsin.